Edit: The decision has been made to retain the role and, apparently, the name. A press release was issued from the Attorney-General on 22 Feb 2010. Last month the state government released a consultative paper A Review of Justices of the Peace in Victoria. 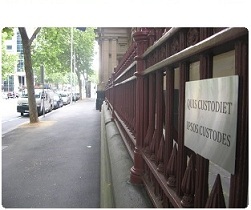 There are currently two types of honorary justice in Victoria: JPs and bail justices. It seems that the role of bail justices, volunteers who conduct out-of-hours bail hearings, will survive the imminent reforms to the Bail Act and continue for the forseeable future. The survival of the office of JP doesn't look to be so likely. The powers of a Justice of the Peace have been restricted more and more over the years. Once, the office was a creature of the common law with vaguely-defined but wide-ranging powers and duties. Half a century ago the functions of a JP were similar to a magistrate's. Since the mid 80s, JPs don't perform any official functions other than the witnessing of documents, a power now granted to many professionals and office-holders. Submissions on the future of JPs have to be in by the end of the month. Whatever changes are coming are likely to be included in the raft of reforms planned for next year.